Anomalous left coronary artery from the pulmonary trunk most commonly occurs in isolation. However, it has been known to be associated with other cardiac lesions, including ventricular septal defect. ,,,, In a case of anomalous left coronary artery from the pulmonary trunk, the clinical manifestations are due to left coronary artery steal from the left coronary artery to the pulmonary artery and insufficient collateral flow from the right coronary artery. When the associated lesions are significant the pulmonary artery pressure increases and maintains the coronary artery perfusion. Previous reports have described fatal outcome after ligation of a patent ductus arteriosus in patients with undiagnosed anomalous left coronary artery from the pulmonary trunk. 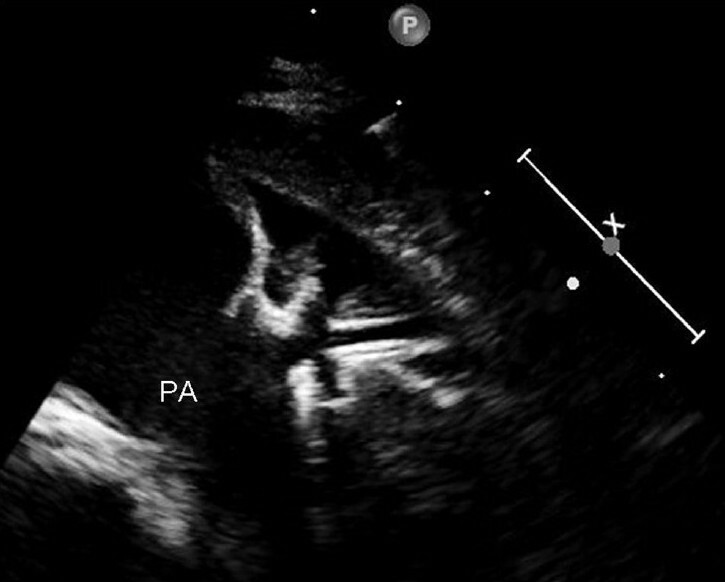 We present an infant with pulmonary hypertension secondary to a moderate-sized perimembraneous ventricular septal defect and anomalous left coronary artery from the pulmonary trunk and preserved left ventricular function. An 18-month-old female infant was referred to our institution with history of repeated chest infections. The physical examination showed that the heart rate was 140/min and regular, with a respiratory rate of 48/min, but no respiratory distress was noted. The cardiac examination revealed a hyperactive precardium. The first heart sound was normal and the pulmonary component of the second heart sound was increased in intensity. A mid-diastolic rumble was appreciated at the apex. Chest X-ray showed cardiomegaly, with features of increased pulmonary blood flow. An electrocardiogram (ECG) showed biventricular hypertrophy with sinus rhytum. 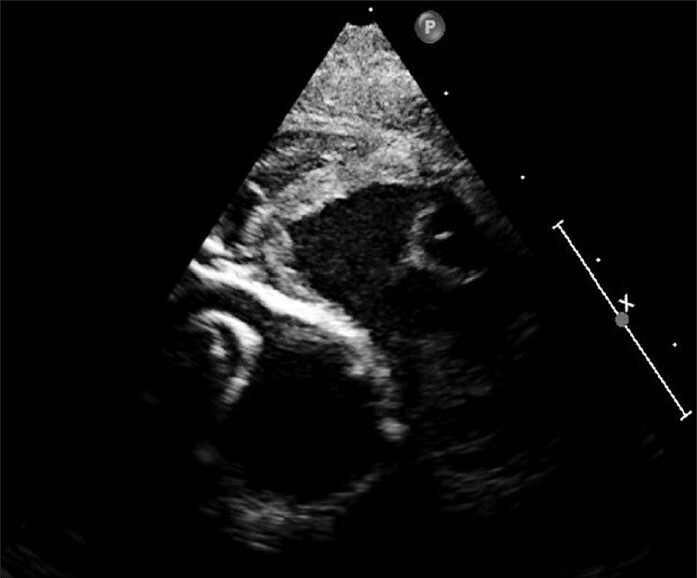 Echocardiogram showed a moderate-sized perimemebraneous ventricular septal defect with left to right flow (max systolic gradient of 40 mmHg), mild mitral regurgitation and elevated pulmonary artery pressure. Further evaluation showed anomalously originating left main coronary artery. It originated from the rightward portion of the pulmonary sinus [Figure 1] and [Figure 2]. Right coronary artery was dilated [Figure 3]. The child underwent successful translocation of the left main coronary artery to the aorta and ventricular septal defect closure, and has been doing well on follow-up. Anomalous left coronary artery from the pulmonary trunk or Bland-White-Garland syndrome More Details is a rare congenital cardiac anomaly generally occurring in isolation. Clinical manifestations of anomalous left coronary artery from the pulmonary trunk are due to myocardial ischemia secondary to low-pressure coronary perfusion with poorly oxygenated blood and insufficient collateral flow from the right coronary artery. 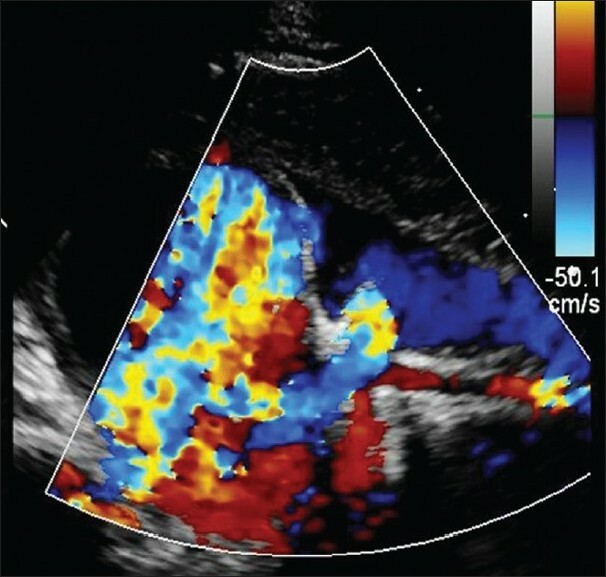 Dramatic changes occur in the coronary circulation in infants with anomalous left coronary artery from the pulmonary trunk within the first weeks of life. Fetal cardiac function remains normal owing to the elevated pulmonary artery pressures. After birth, high pulmonary artery pressure and pulmonary vascular resistance persist allowing the myocardium perfused by the anomalous artery to remain well. In the first few days, pulmonary vascular resistance falls and myocardial ischemia ensues. Severe left ventricular dysfunction and mitral insufficiency develop rapidly. The age of onset of symptoms varies depending on the rate of fall of pulmonary artery pressure and the development of collateral connections with the right coronary artery. If left untreated, 90% of the infants will not survive the first year of life. ,, In a small proportion, the left ventricle gradually improves over a period of 4-6 weeks as the collaterals develop. Presence of a significant post-tricuspid shunt prevents the fall in the pulmonary artery pressure and also provides oxygenated blood to the left coronary artery system, preventing left ventricular decompensation. Left ventricular dysfunction is a common finding in the immediate post-operative period in patients with large post-tricuspid left to right shunts. It is not often possible to delineate coronary artery blood flow due to inadequacy of echo windows. If the left ventricular dysfunction is secondary to unmasking of anomalous left coronary artery from the pulmonary trunk, a poorly contracting left ventricle with hyperechoic papillary muscles and variable degree mitral valve incompetence may be the only markers. , A cardiac catheterization with aortic root angiogram or an ECG-gated computed tomogram will help in diagnosing the condition. In our patient, the presence of a moderately large ventricular septal defect prevented fall in pulmonary artery pressure and maintained antegrade delivery of oxygenated blood to the left main coronary artery. Ventricular septal defect closure alone would have been met with poor outcome. With a carefully done echocardiography, we were able to diagnose the condition before surgery and prevent a catastrophe. Hence, it is imperative to demonstrate coronary artery anatomy on 2D echocardiography and color Doppler in all patients before surgical repair of post-tricuspid shunt lesions such as ventricular septal defects or large arterial ducts. 1. Ortiz E, deLeval M, Somerville J. Ductus arteriosus associated with an anomalous left coronary artery arising from the pulmonary artery: Catastrophe after duct ligation. Br Heart J 1986;55:415-7. 2. Vlodaver Z, Neufeld HN, Edwards JE. Coronary arterial variations in the normal heart and in congenital heart disease. New York: Academic Press; 1975. p. 84. 3. Robinson PJ, Sullivan ID, Kumpeng V, Anderson RH, Macartney FJ. Anomalous origin of the left coronary artery from the pulmonary trunk. Potential for false negative diagnosis with cross sectional echocardiography. Br Heart J 1984;52:272-7. 4. Dodge-Khatami A, Mavroudis C, Backer CL. Congenital Heart Surgery Nomenclature and Database Project: Anomalies of the coronary arteries. Ann Thorac Surg 2000;69:270-97. 5. Thomas St, Korah TK, Madhu AP, Vinayak S, Roy JK. Anomalous left anterior desending coronary artery from pulmonary artery with ventricular septal defect. Ann Thorac Surg 2007;83:1175-7. 6. Shanmugam G, McLenn A, James CP, MacArthur KJ. Anomalous left coronary artery, ventricular septal defect and double aortic arch. Ann Thorac Surg 2005; 80:334-6. Awasthy, N. and Radhakrishnan, S.